The four semi-finalists of the 2018-19 Ranji Trophy seasons have been decided after an enthralling quarter-final stage saw the likes of Kerela and Saurashtra script history while the likes of Karnataka and defending champions, Vidarbha displayed another pristine effort to book their spots in the top-4. While 2017-18 champions, Vidarbha will square off against Kerela in the first semi-final, Saurashtra and Karnataka will lock horns in the other in a bid to stake their claim for the summit clash. The semi-finals will be played on Thursday while the final will take place on February, 06. A record-breaking run-chase by Saurashtra saw them go past Uttar Pradesh and book their spot in the semi-finals of the 2018-19 Ranji Trophy. Needing a record 372-runs to win, Saurashtra, rode on opener Harvick Desai's maiden FC ton and finishing touches from Pujara  and Sheldon Jackson  to register the highest-ever successful run-chase in the history of the tournament. Saurashtra started the day at 2-195 and was jolted by the dismissals of Desai and Kamlesh Makvana with 236 runs on the board. But, Pujara and Sheldon Jackson's unbeaten 136-run stand squashed Uttar Pradesh's hopes of staging a comeback l, helping their side stroll past the target with six wickets still in the tank. Saurashtra will now square off against Karnataka, who booked their spot in the semi-finals by beating Rajasthan after Karun Nair  and skipper Manish Pandey's belligerent 75-ball-87 led them to a six-wicket win in the quarters. Karnataka would not have been in such situation had it not been for the 97-run tenth-wicket stand between Vinay Kumar  and Ronit More after the home side was reduced to 9-166 in reply to Rajasthan's 224 in the first innings. After taking a 39-run lead in the first innings, the duo of Gowtham [4-54] and Shreyas Gopal [3-52] combined to take seven wickets between them to bowl Rajasthan for 222. Chasing 185, Karnataka were reduced to 4-56 before a 129-run stand between Manish Pandey and Karun Nair meant they will now face Saurashtra in a bid to stake their claim for the summit clash on 3rd February. The defending Ranji Trophy champions sealed their spot into the semi-finals of the 2018-19 season by handing an innings & 115 runs defeat to Team Uttarakhand. 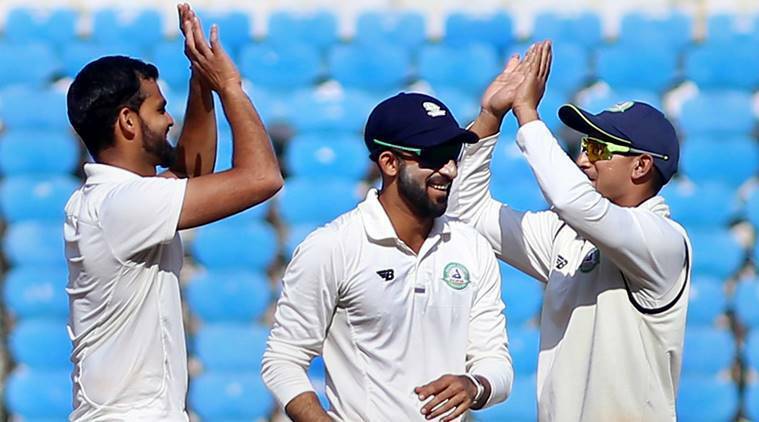 The win was set-up by a pristine batting performance- led by Wasim Jaffer  and Sanjay Ramaswamy's 141 after Uttarakhand had scored 355 in their first innings. Wicket-keeper Akshay Wadkar  and Sarwate  also chipped with crucial contributions down the order to help Vidarbha post a mammoth 629. Sarwate [5-55] wasn't done yet as he along with Umesh Yadav [5-23] ran through Uttarakhand's batting to bowl them out for 159 to help their side book their spot into the top-4. Their semi-final opponents will be Kerela, who bettered their performance from the last season, when they reached the quarter-finals for the first time, as they humbled Gujarat by 113 runs to seal a spot in the top-4. After scoring an underwhelming 9-185 in their first innings, Kerela, on the back of an all-round bowling performance, came back valiantly to restrict Gujarat for 162. Sandeep Warrior spearheaded the bowling attack with figures of 4-42 while Basil Thampi [3-61] and Nidheesh [3-38] chipped in with three wickets apiece. Thampi backed it up with yet another pristine bowling performance in the second innings as he claimed a five-wicket haul to help his side defend 194 by bowling Gujarat out for 81 in a mere 31.3 overs.